Creating related products manually is a very time-consuming procedure. Luckily, there are lots of third-party tools aimed at improving the default functionality of Magento. For instance, aheadWorks offers the Automatic Related Products extension and two less complicated modules: Who Viewed This Also Viewed and Who Bought This Also Bought. Today, we are going to tell you about another reliable tool – the Magento 2 Automatic Related Products extension by Amasty. For managing products display, the Amasty Automatic Related Products extension allows you to rely on automatically defined related items that are shown on product pages. Also, it is always possible to fine-tune the display according to your needs. 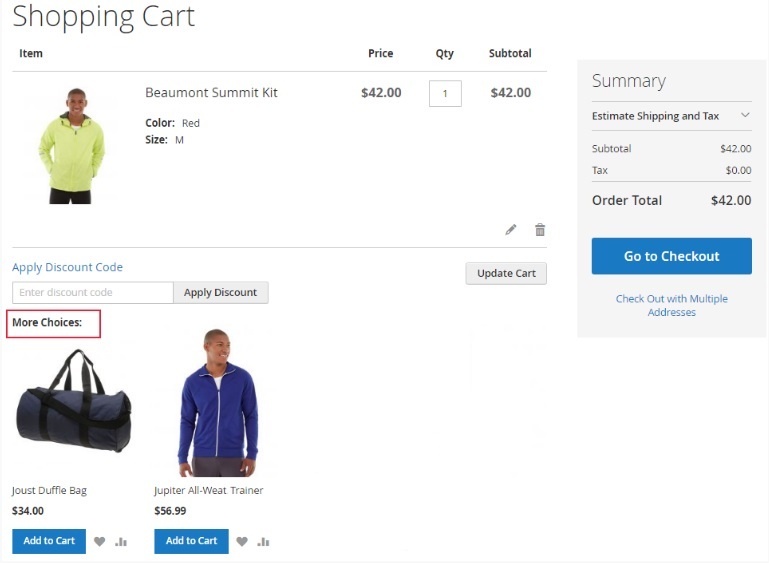 Having installed the Magento 2 automatic related products extension, you can display up-selling products according to the specified parameters and easily configurable settings, as well as show cross-selling products on a cart page. Due to different product view types, you can provide your customers with a wide variety of products. 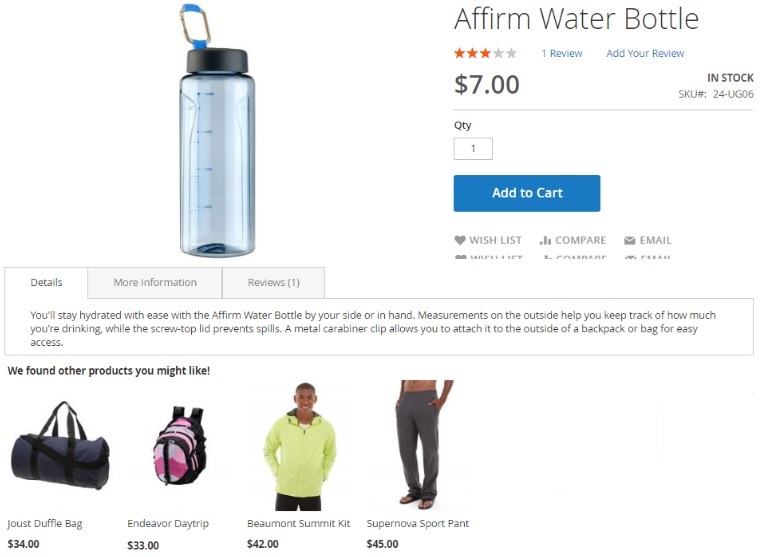 The Magento 2 automatic related products extension lets you display cross-sells, up-sells, and related products in separate tabs. Besides, there is an opportunity to show cross-selling products on a shopping cart page, increasing the number of spontaneous purchases. Moreover, you do not have to worry about the relevance of the displayed results. Amasty Automatic Related Products for Magento 2 and 1 carefully analyzes sales defining which products are frequently bought (or viewed) together. Based on the collected data, the Magento 2 automatic related products extension shows the most relevant results in each block. At the same time, you get the possibility to show related products without views or purchases history. Using this data source, you can display your products based on various conditions and their combinations, like the brand, price, or category. As for the stats data gathering, you can not only specify a specific time period but also indicate the number of store visitors and customers. Next, the module will select the most relevant products providing shoppers with the items they exactly need. At the same time, out of stock items can be easily excluded from the display, making the content of all three blocks even more precise and customer-oriented. It is also necessary to say a few words about views and purchases as a basis of the algorithm. The module is extremely flexible and allows you to choose whether to display related products either viewed with chosen items or bought together with them. In case you use the ‘bought together’ option, the module lets you specify the order status, making displayed results even more relevant. Also, if you’ve already added related products manually, Amasty Automatic Related Products for Magento 2 and 1 lets you replace everything automatically. There is no need to spend hours of time matching up-selling, cross-selling, and related items manually. You can configure the module under Stores -> Settings -> Configuration -> Amasty Extensions -> Automatic Related Products. 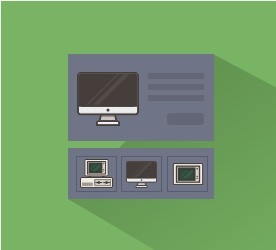 There are four different sections of settings: General, Up-Sells, Cross-Sells, and Related Products. In the first section, you specify the query limit for a period. Next, there is the Up-Sells section. You can enable/disable the up-sell block here, specify maximum products count per block, and decide whether to display, replace, or append to manually added products. Besides, there is an option that lets you hide out of stock items from the block – set Show In Stock Products Only to Yes. Also, you can show upsell products only for out of stock items. The next setting allows you to choose data source: Viewed together, Bought together, Product Attributes, or Product currently viewed. You can also specify a period for data that will be analyzed by the algorithm. The last three options let you make the block more precise by defining category, brand, and price conditions. The Cross-sells settings also provide the ability to enable or disable the block; specify maximum products count; display, replace, or append to manually added products; display only in-stock products; show cross-sell products for out of stock items only; choose data source; and specify data gathered period. As for the flexible rules that can be set for relating products, you will find them under Marketing -> Amasty Related Products -> Related Product Rules. 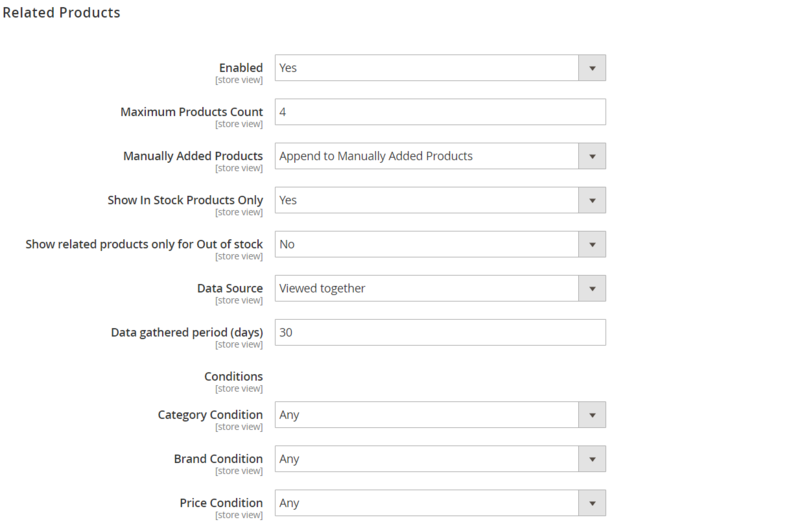 The Related Product Rules grid shows an ID and name of existing rules and applicable store view. From the Action column, you can edit or delete each rule. When creating a new rule, you should set options in two sections: Rule Information and Product Conditions. In the first tab, create a name for the rule and select store views where it will be applied. In Product Conditions, choose the necessary attributes for applying the product relation rule. New data source was introduced – Product Currently Viewed. 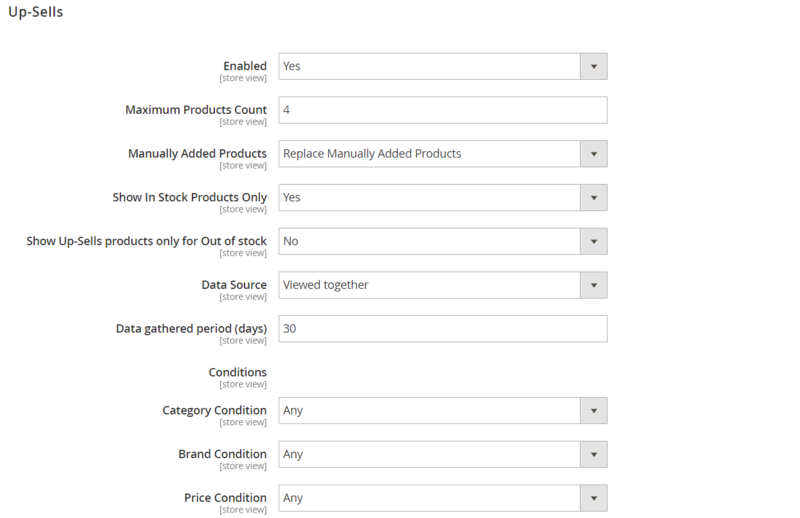 Now, related products can be displayed based on multiple conditions without the sales or views history. New data source was implemented – Product Attributes. 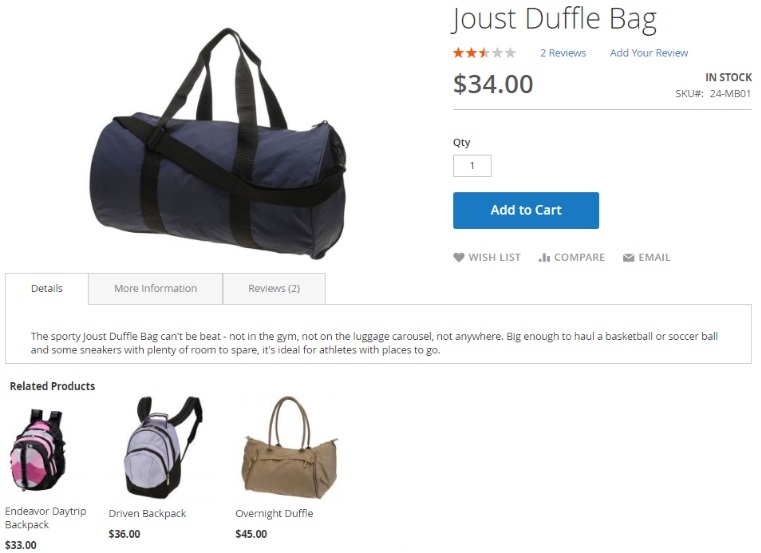 Now, you can show related products based on the rules of product attributes. As you can see, Amasty Automatic Related Products for Magento 2 and 1 has a very user-friendly and intuitive backend interface, so you can easily fine tune the extension saving hours of time necessary for creating up-sells, cross-sells, and related products manually. 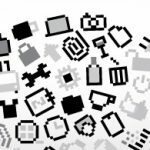 At the same time, your customers will get very precise blocks with the most relevant items displayed based on the customers data. As for the price of Automatic Related Products, Amasty charges $199 for the M2 module and $79 for its predecessor.